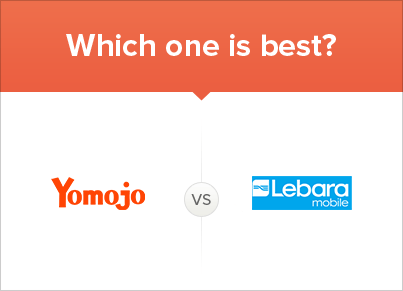 Comparing Yomojo VS Lebara – Which Is Best For You ? Here are the key findings for both Yomojo and Lebara services & coverage, there are more details in the article which follows below. Lebara provides their subscribers with access to the 3.5G Vodafone network, with plans containing generous mobile data allowances. Both of the two MVNOs provide unlimited texting and calls and are competitively priced. Yomojo operates on the Optus 4G Plus network, which provides slightly better coverage than the Vodafone Australia 3.5G network. Yomojo are unique in the Australian market. They offer you an unbelievable range of plans. Yomojo’s plans are completely configurable through their website. They also have some pre-configured unlimited plans for those who want a more standardised plan. Yomojo recently revised their plan range and now offer prepaid plans only. Yomojo offer special software which will help you manage your child’s phone remotely, keeping them safer on the web. Yomojo also offer a stepped discount of up to 15% off your total bill if you take 6 or more SIMs from them at any one time. Yomojo use the full Optus 4G network. You’ll get the latest 4G speeds in 4G coverage areas in all the same places as customers who go to Optus direct. Yomojo Unlimited $9.90 = 200 minutes of standard calling and unlimited SMS in Oz + 1GB. Yomojo Unlimited $15.90 = Unlimited calls and SMS in Oz + 2GB. Yomojo Unlimited $19.90 = Unlimited calls and SMS in Oz + 4GB. Yomojo Unlimited $29.90 = Unlimited calls and SMS in Oz + 10GB. Yomojo Unlimited $34.90 = Unlimited calls and SMS in Oz + 16GB. You can learn more about them and their unique content in our Yomojo review. Yomojo operates on the Optus 4G Plus network and Lebara on the Vodafone Australia 3.5G network. Both of these two companies offer great value plans with ample mobile data allowances, which is great news for heavy data users. Lebara provides their subscribers with great value prepaid plans, from a company with a long history of operating in Australia. For people which also make a lot of international calls to their friends or family, add on $10 and Lebara offer great calling rates. Lebara is on the Vodafone Australia 3.5G network, users with older smartphones that live in city areas can enjoy fast download speeds. For people with 4G enabled smartphones, Yomojo offer fantastic customisable plans on the Optus 4G Plus network. Lebara is the clear winner of the two MVNOs, when it comes to value, connectivity and service. Lebara is an established MVNO in Australia, with a strong international presence, servicing over 5 million subscribers. Yomojo on the other hand, while offering users great customisable plans and fast 4G speeds, is a younger company. For Aussies which use older smartphones, the Vodafone 3.5G network is almost as fast as the Optus 4G Plus network. For Lebara subscribers which live in the major cities, the Vodafone Australia 3.5G network works well with good coverage areas. For rural and remote areas, an MVNO such as Boost Mobile would be the preferred network provider choice. Lebara plans come with big mobile data allowances, at the same price points as Yomojo offers their subscribers. Yomojo subscribers can enjoy the Optus 4G Plus network, while Lebara customers are connected to the Vodafone 3.5G network. For subscribers that have an older version mobile phone, or are not bothered with 4G download speeds, Lebara is perfect. As always, when looking at which of the two companies is best, you need to research your own usage levels. The Optus 4G Plus network covers 98.5 percent of the Australian population, giving users faster data speeds in even more places. The Vodafone Australia 3.5G network covers more than 96% of Australians. Most people these days live and work in a major capital city, which Vodafone Australia’s network covers just fine.In recent years Vodafone has spent millions upgrading their infrastructure to provide enhanced network coverage and connectivity. Both Yomojo and Lebara provide their users with a solid range of great priced plans, with competitive inclusions. As you can see when directly comparing the 1 and 2 prepaid plans, between the two companies, it’s almost the same. There is not much difference between the mobile data allowances, which is great news for subscribers. Yomojo also provides their users with a customisable plan tool, for people which don’t need a lot of data or inclusions. Lebara on the other hand provides great deals for users which need to make a lot of international calls, as seen on their $49.90 plan. Lebara provide access to the 3.5G Vodafone network, which is great for city users but not so good for people in the bush. Yomojo operate on the premier Optus 4G Plus network, providing solid coverage to users around Australia. Vodafone Australia used to get a bad rap for providing access to a sub-quality network, but that was never really the case. Sure a few years back they had and outage and customer service issue, but those days are long in the past. Today, Vodafone Australia has spent a lot of money upgrading their network infrastructure and providing quality services to their subscribers. Yomojo operates on the Optus 4G Plus mobile network, providing fast coverage while using the superior 700 MHz spectrum. For more information on coverage of the Optus 4G network, take a look at the Whatphone coverage page. For people which live in rural Australia, at Whatphone we recommend that you review Boost Mobile, a Telstra 4G network MVNO. Yomojo’s plans can be selected either postpaid or prepaid depending on a users subscription preferences. Lebara provides customers with either a SIM on it’s own, or a SIM with a prepaid plan. Not sure of the difference between prepaid and postpaid? Read the Whatphone explanation. In general though when it comes to prepaid or postpaid, at Whatphone, we believe prepaid plans are be more predictable. Yomojo and Lebara plans come with both small and big amounts of mobile data. For users which don’t need a lot of mobile data, both companies have you covered. If you are a heavy data user Yomojo offers great value on their mid plan $39.90 per month, giving you 6GB of data. Need to make lots of international calls and want to use a little mobile data each month? The Lebara $39.90 month plan is perfect, giving users 500 minutes of international calling and 2.5GB of mobile data. No matter your personal monthly usage habits, both companies offer great deals for subscribers. For Aussies which want full and total customisation over their plans, than Yomojo offer this in spades. Thanks to their customisation tool on the Yomojo website, you can choose exactly how much to pay each month. Who offers the better customer service? Lebara is a much more established company and with a global operation. At last count Lebara had 1000 employees, 5 million customers and offer superior customer service. Yomojo is a new Aussie MVNO and doesn’t have the customer service experience of Lebara as of yet. That’s not to say Yomojo provides poor customer service, far from it, it’s just they are new to the Telco industry. Lebara and Yomojo offer the full suit of customer contact methods. These include on social media, telephone, email and live real-time chat on their respective websites. Most people in Australia these days either live and work in the middle of a major city, or in the suburbs close by. MVNOs like Lebara which use the Vodafone 3.5G network, are able to compete with the Optus mobile network. 3.5G is faster than 3G, but not quite 4G, still for most subscribers it’s fast enough. Lebara are an established company which a solid track record and a long history of operating in Australia as an MVNO. Their 5GB plan comes with enough mobile data for a power user and 500 international calling minutes. For subscribers which need to call overseas a lot and frequently use data on their smartphones, Lebara are a fantastic choice.